My newest granddaughter has arrived. 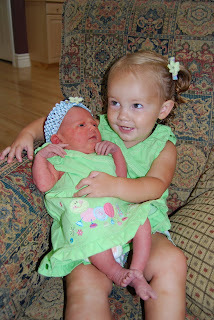 Cara May Romney was born on July 31st. The upper elevations of Yosemite National Park is known as Tuolumne Meadows. The road from the Valley winds it's way up and over Tioga Pass passing several granite peaks and domes and beautiful green meadows and meandering streams. The winter snows give way to pleasant summer temperatures and sparkling mountain lakes. Rock climbers from all over come to Tuolumne in the summer to climb the exquisite granite faces of these domes and pinnacles. I had made plans many months in advance to visit Tuolumne with a climbing buddy, Chad Farr and test myself on some of the classic routes. 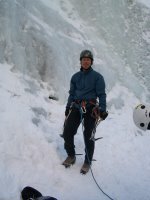 For weeks prior to leaving on this climbing trip I had searched the internet for information about the different peaks and rock climbs of Tuolumne. I had made a list of classic route names and their difficulty grades and hoped to take advantage of every minute of daylight while I was there to climb. Chad had climbed there more than 5 years previously and had great things to say regarding the climbing in Tuolumne. We arrived late one night after driving for 8 hours across the Nevada desert. All of the formal campgrounds were full, therefore, we ended up "boon-docking" along side of a spur road overlooking a beautiful mountain valley with a small but fast flowing stream running through it. Chad had fixed up the back of his pick-up truck with a shell and wooden platform which provided us with a fine place to sleep. The next morning the air was crisp and cool and the mountain peaks were still covered in some snow left over from the previous winter. We soon broke "camp" and headed into Yosemite to choose our first climb. We decided upon "Cathedral Peak", (it seems like every mountain range has at least one peaked named Cathedral Peak). This peak's southeast side was known to have a moderately easy climb of about 6 pitches up a beautiful sweeping granite face ending on a spectacular summit block. We got a relatively late start and the approach hike took us two hours and left us gasping in the thin air and sweating profusely in the summer sun. White puffy clouds began to appear on the horizon, but none that looked too concerning to us at that time. Upon arriving at the base of the peak we put on our climbing harnesses and sorted our gear of cams, nuts, slings and carabiners. Chad tied into the rope and lead up the first pitch following easy terrain quickly up to a ledge with a small tree on it. Soon I was at his side getting ready for my lead of the second pitch. Our rope was 70 meters long (about 229 feet) and helped us progress faster up the face compared to the old standard 50 meter ropes of the past. My lead up the next couple of hundred feet of rock was fun and relatively easy except for one 15 foot section that required commitment and confidence in my gear placements. Chad then lead the crux pitch through a chimney section that proved to be quite fun. As we neared the summit the skies to the east began to darken as thunderstorms began to form. Rumbling from distant thunder began to makes us nervous. The final climb up to the summit was interesting. This peak truly had one block thrust up about 20 feet. I climbed up onto it and realized it was about the size of our kitchen table on top. I took some quick photos and then quickly scrambled back down to Chad belaying me in a notch between the summit and another lesser leaning block. I couldn't think of a better place to be to try and be struck with a bolt of lightning. We could see and hear an impressive storm bearing down on us from the east. Our scramble off the summit and down the flanks of the other side of the mountain was swift considering that we were still wearing our climbing shoes. A moment before reaching our packs the storm hit us. Hail the size of dimes with occasional nickels pelted us fiercely. Sometimes the hail would hit my ear or some other part of my head and it hurt! Then came the rain. We huddled under a tree further down the mountain and waited out the storm. The ground was covered in so much hail that it looked as if it had snowed. Forty five minutes later we began to hike out and the sun came out again and began to dry things off. The stream did rise and become muddy confirming the strength of the storm. The forest smelled wonderful and the leaves were all green and wet from the rain. We began to meet other hikers as we neared the road and the main trail. We both looked forward to making our pasta dinner that evening as we rested from the hike and climb and began to plan our adventure for the next day.